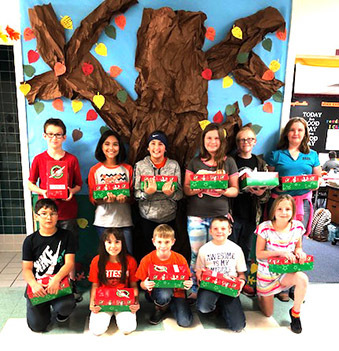 Fifth-graders from Hermosa Elementary School pose with shoeboxes they filled to benefit Operation Christmas Child. Fifth-grade teacher Krystal Craft says the literature unit has been focusing on doing good deeds. “These students, with the help of their parents, took the opportunity to apply their learning to their personal lives,” Craft said. The students packed the shoeboxes with necessities and gifts for children in war- and poverty-ravaged nations around the world.